When Americans are asked to describe Republican presidential candidate Herman Cain in a single word, they most frequently offer a series of numbers: “9-9-9.” Cain’s tax proposal is mentioned more often than his background as a businessman. The latest survey by the Pew Research Center for the People & the Press and The Washington Post, conducted Oct. 13-16 among 1,007 adults, finds that many Americans are unable to come up with words to describe the three GOP candidates. 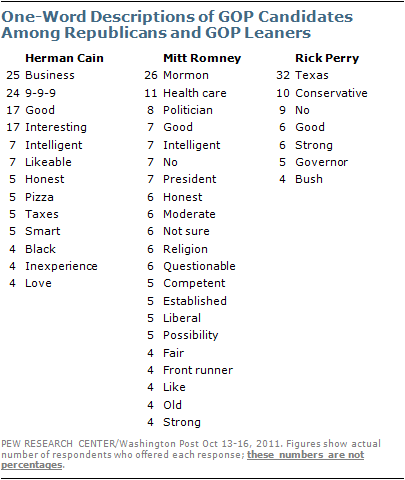 Nearly half (46%) did not offer a one-word description of Cain, 44% did not offer a word to describe Perry and 37% did not have a one-word description of Romney. About as many use positive words (12%) as negative words (14%) to describe Cain. For Romney, 21% use negative words while 11% use positive ones. And for Perry, 25% use negative descriptors compared with just 6% who use positive ones. Even among Republicans and Republican-leaning independents, more use negative words than positive words to describe Perry (19% vs. 9%). 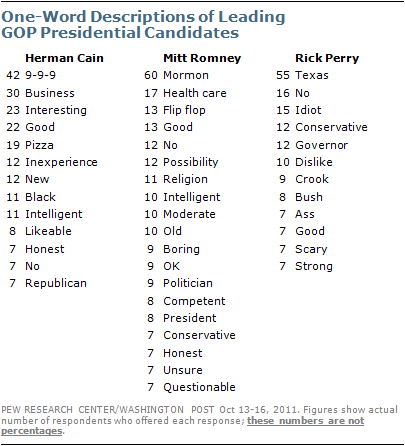 For Romney, about as m any Republicans use positive descriptors as negative ones (18% vs. 15%). Among the three GOP candidates, Cain is the only one who draws many more positive one-word reactions than negative reactions among Republicans (22% vs. 5%).